Washington (CNN) - The U.S. House on Tuesday passed a $1.15 billion measure to fund a settlement initially reached between the Agriculture Department and minority farmers more than a decade ago. could receive $50,000 each to settle claims of racial bias. (WASHINGTON) CNN - New York Republican Rep. Peter King is blasting the Pentagon for the release of confidential State Department documents by the controversial whistle-blowing website Wikileaks. During an interview with CNN Lead Political Anchor Wolf Blitzer in the Situation Room Tuesday, the ranking member of the House Homeland Security Committee blamed the Defense Department for failing to secure documents that were allegedly leaked at the hands of an army private. 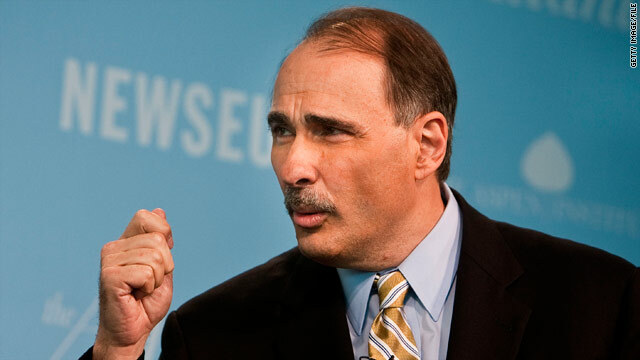 Washington (CNN) - President Obama's senior adviser David Axelrod is adamant that the "don't ask, don't tell" policy will end. During an interview with CNN Lead Political Anchor Wolf Blitzer in the Situation Room, Axelrod said of the military's controversial "don't ask, don't tell" provision, "This policy is gonna end." Washington (CNN) - Maryland Gov. Martin O'Malley will be named Wednesday as the incoming head of the Democratic Governors Association, a Democratic source confirms to CNN. O'Malley, who won re-election earlier this month to a second term by a double digit margin over former Republican Gov. Bob Ehrlich, is expected to be formally announced as incoming chairman at a meeting of a dozen Democratic governors and governor-elects here in the nation's capitol. A release from the DGA says the governors will discuss "the challenges and opportunities for Democrats, and how we continue to move our nation forward in a fiscally responsible way to create jobs and put Americans back to work." (CNN) – Americans are at odds over how to tighten the country's fiscal belt and that's reflected in a similar conflict in leaders of government. Ninety percent of the public can agree that the economy is the most important issue right now. But according to a new Associated Press-CNBC poll, the nation is divided over how to resolve the expanding deficit, which already exceeds one trillion dollars. New York (CNNMoney.com)- The leaders of President Obama's debt commission said Tuesday that they would delay a vote on final recommendations until Friday. The vote was originally scheduled for Wednesday. The commission's co-chairmen, Erskine Bowles and Alan Simpson, said they would still their report on Wednesday. (CNN) - Defense Secretary Robert Gates said Tuesday the long awaited Pentagon report on the military's "don't ask, don't tell" policy indicates that over two-thirds of service members do not object to gays and lesbians serving openly in the U.S. armed forces. Gates urged the Senate to pass a repeal of the policy before it is repealed by "judicial fiat." NEW YORK (CNNMoney.com) - The Obama administration and congressional leaders have begun talks toward a deal on extending Bush-era tax cuts, President Obama said after a meeting with representatives of both parties Tuesday. "That process is beginning right away, and we expect to get some answers back in the next couple of days," Obama said after Tuesday's meeting at the White House. Washington (CNN) - A political summit between President Barack Obama and congressional leaders Tuesday yielded further talks on whether to extend Bush-era tax breaks scheduled to expire at the end of the year, as well as an acknowledgement from Obama that he needs to reach out more to Republicans. The meeting, dubbed by some the "Slurpee summit" in reference to a campaign dig by Obama at congressional Republicans, involved the president and leaders of both parties from the House and Senate. Latino leaders in Nevada have begun to float the idea of breaking their long ties to the Democratic Party and forming their own party - the Tequila Party, the Las Vegas Sun reports.